John Muir wrote these words in the early years of the 20th century. He lived much of his life near to the mountains. Mountains have been on my mind of late, although I don’t live near any. Perhaps the trigger was that one night not long ago we watched an excellent documentary on mountains, inspired by the work of Robert Macfarlane, one of my favorite contemporary writers. Watching this film took me back many decades, to my time as a young woman backpacking in the Beartooth Wilderness of western Montana. My summer college job was counselor at Badlands Bible Camp near Medora, N.D. The camp director selected me to be his female counterpart for a weeklong backpack trip with high school campers from western North Dakota scheduled for the end of the camp’s summer season. By this point, I had spent a lifetime camping and hiking in wild places but had not yet backpacked, so I was very excited about this assignment and proud that I was selected. At the beginning of the summer, my mother and aunt had sewn me a down-filled sleeping bag from a Frostline kit they ordered (I still have that sleeping bag) after listening to my complaints about being cold in my bunk in the uninsulated camp dorm building. I went home to the farm for the weekend between staff training and the arrival of the first campers, we spread out the kit on the farmhouse floor, and they went to work with my mother’s sewing machine. By mid-June, my hiking boots were well broken-in, after days filled with leading kids on Bad Lands hikes. And I was extremely fit from climbing buttes, hence ready to carry a very heavy pack for a week. The kids gathered at the camp on a late July Sunday afternoon. We spent the rest of the day in drills designed to assure we could erect our Eureka! tents as quickly as possible and sorting through our possessions so that our packs carried as little as possible. We even broke off the end of our toothbrushes in the effort to minimize weight. The camp director’s wife advised me to remind her husband to brush his teeth now and then, something he was wont to do when backpacking. Together we assembled tinfoil dinners for our first night at the base camp near Red Lodge, Mont., and filled peanut butter tubes for high-energy trail lunches. Tent practice sessions. I’m the first seated on the left. The camp director has his hand on the tent. The campers I was leading were not much younger than I and, unlike me, none had ever been to the mountains. As we drove west through Montana, we made it a contest to see who could first spot the mountains on the horizon. I still have the green down vest shown in this photo, a major purchase for a poor college student. It did double duty as my pillow on expeditions. Although the pictures have faded, my memory is crystal clear of the moment we hoisted our packs and hiked past the boundary sign to the Beartooth Wilderness. “Wilderness!” That is a word that still stirs such thrill in me. At the time, I didn’t fully understand that I had grown up surrounded by nearly one-half million acres of de facto badlands wilderness. On Day One, we hiked to Quinnebaugh Meadows, where we set up our first camp. We carried a tin cup clipped with a Carabiner to our packs. We were hiking along Rock Creek, so whenever we were thirsty, we would simply dip our cups into the icy stream and drink. It was only a couple of years later that this became unsafe and hikers had to carry filters to avoid giardia. We all took dozens of photos of the cold mountain streams and waterfalls, never quite able to capture their beauty on static film. We played games of “who could keep their feet in the snowmelt the longest” and rock-hopping. By Day Two, we arrived at the base of Sundance Pass. We braced ourselves for the crossing of the pass the next day. It was very humbling to look up to the top of the pass, at switchback over switchback over switchback, knowing that on the next day, we’d be hiking up — and over — and down the other side. Most summer afternoons in the mountains brings showers, so by now we were experienced at protecting ourselves from the cold rain as well as heating water and freeze-dried food on our portable white gas stoves. The next morning, when we emerged from our tents, we could see that it was snowing high up on the pass. There was nothing to do but gobble down some hot oatmeal, pull on our packs and trudge upward. The switchbacks of Sundance Pass are visible in the background of this photo of me washing my hair in snowmelt. Thus, it was that my first crossing of Sundance Pass was made in a blizzard, encouraging along novices so that no one would succumb to hypothermia. The exertion kept us all warm and we were completely spent by the time we crawled into our sleeping bags in our tents next to the little lake a few miles from the base of the “other” side of the pass. At the end of the journey, we peeled the moleskin off our weary feet, turned on the radio in the camp van to catch up on what had happened in the world while we were off the grid and drove into Red Lodge to gorge on pizza. 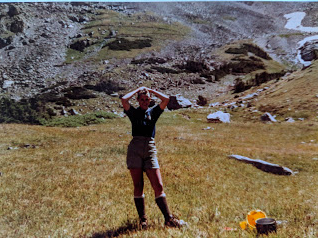 Years later, I took my own children on a day hike in the Beartooth Wilderness, encouraging them along the trail when their energy flagged, just as I had those campers of days past. Hiking behind my daughter, I marveled at her strong little legs propelling her along. Little had I known that these trips in my early 20s would prepare me for many adventures to come, a springboard to a life spent exploring wild places, including two more backpacking trips in the Beartooth Wilderness, canoeing in the Boundary Waters several times, kayaking the Little Missouri River countless times, winter camping in the Appalachians, overnighting at the Dry Tortugas and rafting the Colorado River for my 40th birthday. So it was that I became WildDakotaWoman. Now, if the danged U.S. government would just reopen, I’ll set out on my next adventure to wild places. Wonderful Lillian! Takes me back 60 years or so!